A mine-resistant truck manufactured by the Defense Industries Organization (DIO) named “Toufan” is about to enter service with the Revolutionary Guard (IRGC) this year. The vehicle subscribes to characteristics found in similar models like a bulletproof hull and high ground clearance. Upon closer inspection the “Typhoon” unveiled by Iran’s defense ministry in late November is a copy of the Streit Group’s own Typhoon MRAP. 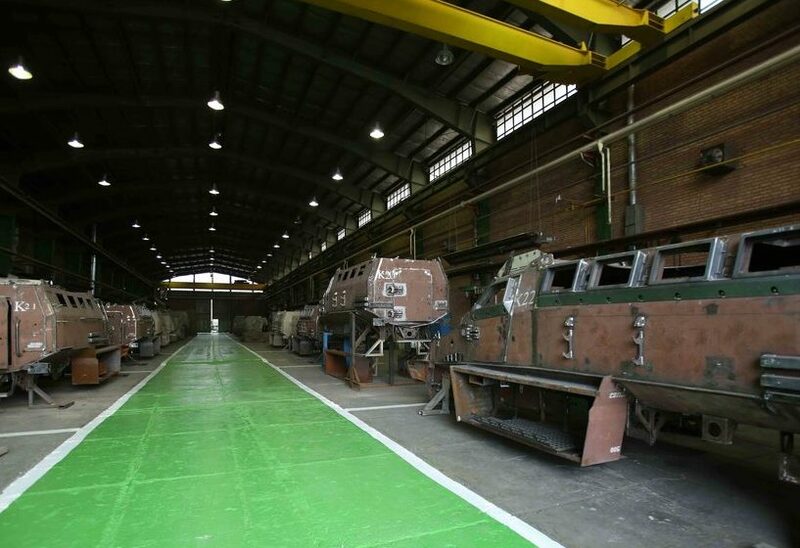 Photos released by Iranian state media showed an active production line for the Toufan, which shouldn’t be confused with a similar vehicle from Azerbaijan, proving once again how resilient Iran’s military industries are. The Toufan isn’t exactly as new as Iranian propaganda insists. Photos of it circulated in social media as far back as 2016 and curious Iranians even snapped posters listing its specifications. It has been found out the Toufan runs on a Russian diesel engine and is an almost exact replica of the original Typhoon, with seating for eight passengers and two crew. The few differences between the Toufan and Typhoon are superficial, such as the location of a spare tire on the former’s hull. But Streit Group, which has production sites in several countries, has spoken out against the Toufan and is exploring legal options for redress. Details shared by company representatives reveal their Typhoon model was copied and specific features–such as the bumper–were changed. The extent of industrial espionage committed by Iranian agents on Streit Group’s property hasn’t been ascertained, but its outcome is now being hailed by the state’s propaganda machine. The assembly line for the Toufan. Each truck is built on a monocoque hull of welded steel panels. Via Iranian media. Promotional video clips shared by Iranian state media showed a convoy of Toufans driving across open terrain with ease–its chassis does have an independent suspension system supporting runflat tires. The press conference to announce its existence did show a row of vehicles, totaling five, parked inside a factory. Each Toufan had a roof hatch for mounting a turret. The only armed Toufan shown by Iranian media has a Chinese 14.5mm machine gun. Its role was described as a protected transport for counter-terrorism, which makes sense when the IRGC is battling Kurdish separatists in the country’s northwest and drug cartels in the southeast. The Toufan isn’t the DIO’s first attempt at an MRAP, however. In previous decades state-owned vehicle factories managed to churn out wheeled protected transports but these were inferior when compared to similar efforts by Iran’s neighbors. One example is the short-lived Rakhsh 4×4 that could support a 23mm anti-aircraft gun on a roof turret. But it was only made in limited quantities with a small number exported to Sudan. Another poor effort was cannibalizing a Soviet BTR-60 to fit a 4×4 chassis. 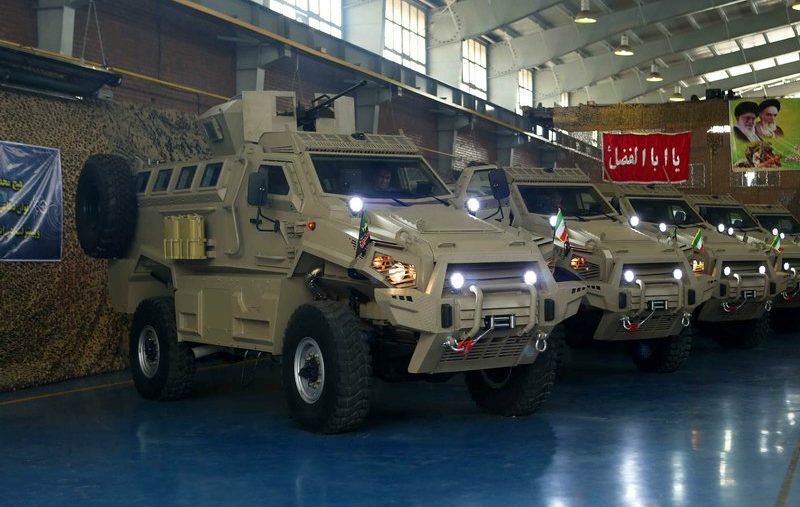 Iran’s military industries enjoyed more success with unarmored tactical vehicles like the Safir jeep, whose combat record is formidable, and the Aras/Arash pickup truck. 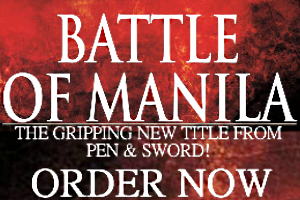 But the DIO’s output for locally made equipment and weapons is far from impressive. While various subsidiaries helped assemble hundreds of Russian T-72S tanks in the 1990s (the total reached 538) to augment the Artesh’ depleted armor fleet, mass-producing troop carriers like the Boragh and self-propelled artillery weren’t as successful. While the defense ministry’s hyperbole regarding its technological prowess is sometimes dubious, other efforts do live up to the hype. The Toufan looks like a valuable asset for the IRGC with its ballistic protection (either STANAG II or III) making it impervious to 7.62x39mm and 7.62x51mm rounds; better understood as AK-47’s and light machine guns. Whether a remote weapon station and thermal cameras (there’s a small CCTV camera above the windshield, in fact) are added soon is up to the DIO.